Activation of transcription factor NF-κB involves the signal-dependent degradation of basally phosphorylated inhibitors such as IκBα. In response to proinflammatory cytokines or mitogens, the transduction machinery has recently been characterized, but the activation mechanism upon oxidative stress remains unknown. In the present work, we provide several lines of evidence that NF-κB activation in a T lymphocytic cell line (EL4) by hydrogen peroxide (H2O2) did not involve phosphorylation of the serine residues 32 and 36 in the amino-terminal part of IκBα. Indeed, mutation of Ser32 and Ser36 blocked IL-1β- or PMA-induced NF-κB activation, but had no effect on its activation by H2O2. Although IκBα was phosphorylated upon exposure to H2O2, tyrosine residue 42 and the C-terminal PEST (proline-glutamic acid-serine-threonine) domain played an important role. Indeed, mutation of tyrosine 42 or serine/threonine residues of the PEST domain abolished NF-κB activation by H2O2, while it had no effect on activation by IL-1β or PMA-ionomycin. This H2O2-inducible phosphorylation was not dependent on IκB kinase activation, but could involve casein kinase II, because an inhibitor of this enzyme (5,6-dichloro-1-β-d-ribofuranosyl-benzimidazole) blocks NF-κB activation. H2O2-induced IκBα phosphorylation was followed by its degradation by calpain proteases or through the proteasome. Taken together, our findings suggest that NF-κB activation by H2O2 involves a new mechanism that is totally distinct from those triggered by proinflammatory cytokines or mitogens. Growing evidence suggests that cellular reduction/oxidation (redox) status regulates various aspects of cellular function, such as cellular proliferation and activation, as well as growth inhibition and cell death (1). Cellular redox status is maintained by intracellular redox-regulating molecules such as glutathione, glutathione disulfide, and the thioredoxin redox couple (2). Many cells of the immune system of higher organisms use the principle of redox regulation to transduce signals triggered by important receptors such as TCR (3), CD4 and CD8 molecules (4), and cytokine receptors (5, 6, 7). Redox regulation is also used for the adaptive defense mechanisms against environmental hazard, where reactive oxygen species (ROS)3 are produced by activated macrophages and neutrophils as a first line of defense in the process accompanying phagocytosis (8, 9). During an inflammatory response, lymphocytes are exposed to ROS (mainly hydrogen peroxide and hypochlorous acid) derived from activated macrophages and neutrophils. If not generated in too great an amount, ROS can be tolerated by lymphocytes and used as a second messenger in signal transduction processes to regulate gene expression, such as that activated during immune and inflammatory responses (10). One of the downstream targets of ROS is NF-κB, which is the first eukaryotic transcription factor shown to respond directly to oxidative stress (11). The NF-κB transcription factor binds specific DNA sequences as dimers. These are constituted of proteins belonging to the Rel/NF-κB family. In mammals, this family contains proteins p50, p52, p65 (RelA), RelB, and c-Rel (Rel) (12, 13). These five proteins harbor a related, but nonidentical, 300-aa-long Rel homology domain that is responsible for dimerization, nuclear translocation, and specific DNA binding. In addition, RelA, RelB, and c-Rel, but not p50 or p52, contain one or two trans-activating domains. p50 and p52 derive from cytoplasmic precursors named p105 and p100, respectively. NF-κB complexes are sequestered in the cytoplasm of most resting cells by inhibitory proteins belonging to the IκB family (14, 15, 16, 17), comprised of IκBα, IκBβ, IκBε, p100, and p105. In the case of cells stimulated by proinflammatory cytokines such as IL-1β or TNF-α, the signal transduction pathway leading to the phosphorylation and degradation of IκB proteins has recently been clarified in HeLa and L293 cells (18, 19, 20, 21 ; see Refs. 22 and 23 for review). It is included in a 700- to 900-kDa complex called signalsome involving the IκBα kinases (IKK-α and -β) and the NF-κB essential modulator (NEMO). Important partners are proteins associated with the TNF-α or IL-1 receptors, the NF-κB-inducing kinase, and mitogen-activated protein kinase kinase-1. The IKKs phosphorylate the IκBα protein on serines 32 and 36, a reaction that targets IκBα for ubiquitination and rapid degradation by the 26S proteasome. These reactions are extremely rapid, with the cellular IκBα protein being completely degraded within minutes following cell stimulation before being resynthesized to replenish the IκBα cytoplasmic pool. This rapid and transient degradation of IκBα contrasts with its slow and sustained disappearance, observed by several authors, when cells are induced by an extracellular generation of ROS, such as that which occurs during inflammation (11, 24, 25, 26). These differences in the kinetics of IκBα degradation very likely reflect the existence of various signaling pathways leading to IκBα phosphorylation. In this study, we investigated the NF-κB activation mechanism in a murine T lymphocytic cell line treated with hydrogen peroxide (H2O2) and showed that other IκBα amino acids than serines 32 and 36 are required for its degradation and subsequent NF-κB translocation to the nucleus. Tyrosine 42 and serine/threonine residues of the PEST (proline glutamic acid serine threonine) domain of IκBα play a crucial role in the activation mechanism by H2O2 and calpain proteases, and the proteasome are likely to be involved in the degradation of IκBα. The EL4 mouse lymphoma cell line was obtained from American Type Culture Collection (Manassas, VA). Cells were cultured in RPMI 1640 and ultraglutamine with 10% FCS (BioWhittaker, Petit Rechain, Belgium). They were seeded in fresh medium containing 2% FCS 12–24 h before any experiment. EL4 cells expressing human IκBα S32,36A, IκBα Y42F, or IκBα S283A, T291A, T299A mutant proteins were obtained after electroporation of the parental EL4 cells with 80 μg of a plasmid bearing the corresponding human IκBα mutated gene under control of the CMV promoter together with the gene conferring neomycin resistance or with an empty plasmid (EL4/2 cells). Cells were selected over a period of 21 days in the presence of 1 mg/ml neomycin before being cloned by flow cytometry and expanded individually. Expression of the human IκBα mutant proteins was assessed by Western blot analysis. All chemicals were of reagent grade from UCB (Brussels, Belgium) or Sigma (St. Louis, MO). Ionomycin was obtained from Calbiochem (La Jolla, CA). H2O2 was purchased from Merck (Darmstadt, Germany) and was diluted just before being added to cells. H2O2 concentrations were calculated by UV spectrophotometry based on an extinction coefficient value of 80. Lactacystin was a gift from Martin Kroll (Pasteur Institute, Paris, France) or was purchased from Boston Biochemicals (Boston, MA), Z-Asp-Glu-Val-Asp-FMK (Z-DEVD) was obtained from EPS (Livermore, CA), E64-d was obtained from Peptide International (Louisville, KY), and DRB was purchased from Biomol (Boston, MA). A cocktail of phosphatase inhibitors was made of 1 mM Na3VO4, 10 mM β-glycerophosphate, 5 mM NaF, and 200 nM okadaic acid. Plasmid bearing the IκBα S32,36A mutated gene under the control of the CMV promoter was a gift from P. Baeuerle (Micromet, Munchen, Germany). This plasmid gave rise to the expression of a IκBα S32,36A tagged with an extension 15 aa long at the C-terminal. The plasmid containing the IκBα S283A, T291A, T299A gene under the control of the CMV promoter was a gift from J. Hiscott (Montreal, Canada), and the plasmid expressing IκBα Y42F was a gift from J.-F. Peyron (Nice, France). The pNF-κB-Luc reporter construct contains five κB sites from the HIV-1 long terminal repeat cloned upstream of the luciferase gene (Stratagene, La Jolla, CA). EL4 cells (1 × 106/ml culture medium) were cultured in 75-cm2 culture flasks before being treated with H2O2 (0–500 μM). EL4 cell treatment with H2O2 was performed as described previously (7), and 5 × 106 cells were subsequently harvested at various times (between 10 and 240 min) to prepare nuclear and cytoplasmic protein extracts for NF-κB EMSAs and Western blot analysis, respectively. After 48 h, EL4 cells were counted, and cytotoxicity was estimated using trypan blue exclusion. The method used was described previously (27). Briefly, at various times after the oxidative stress, 5 × 106 EL4 cells were washed in 1 ml of cold PBS and centrifuged at 15,000 × g for 15 s, resuspended in 200 μl of cold hypotonic buffer (10 mM HEPES-KOH, 2 mM MgCl2, 0.1 mM EDTA, 10 mM KCl, 1 mM DTT, and 0.5 mM PMSF, pH 7.9), left on ice for 10 min, and then vortex mixed and centrifuged at 15,000 × g for 30 s. Aliquots of supernatant containing the cytoplasmic proteins were quickly frozen in liquid nitrogen and stored at −80°C. The pellets of nuclei were gently resuspended in 15 μl of cold saline buffer (50 mM HEPES-KOH, 50 mM KCl, 300 mM NaCl, 0.1 mM EDTA, 10% (w/v) glycerol, 1 mM DTT, and 0.5 mM PMSF, pH 7.9) and left for 20 min on ice. After centrifugation (15,000 × g for 15 min at 4°C), aliquots of supernatant containing the nuclear proteins were kept in liquid nitrogen and stored at −80°C. Protein concentrations were measured with the Bio-Rad protein assay (Munich, Germany). The method used was previously described (7), with slight modifications. Briefly, 5 μg of nuclear proteins were incubated for 30 min at room temperature with 0.2 ng of 32P-labeled oligonucleotidic probe, 2 μg of BSA, and 1 μg of poly(dI-dC)-poly(dI-dC) (Pharmacia Biotech Benelux, Rozendaal, The Netherlands) in 20 mM HEPES-KOH, 75 mM NaCl, 1 mM EDTA, 5% (v/v) glycerol, 0.5 mM MgCl2, and 1 mM DTT, pH 7.9, buffer (final volume, 10 μl). DNA-protein complexes were then resolved on a nondenaturing 6% (w/v) polyacrylamide gel run for 4 h at 180 V in ×0.25 TBE (2.5 mM Tris, 2.5 mM H3BO3, and 2 mM EDTA, pH 8.5). The gel was dried and autoradiographed on Fuji x-ray film (General Electric, Antwerp, Belgium). For supershift experiments, protein extracts were preincubated with Abs against p50, p65, c-Rel, p52, and RelB (polyclonal Abs from Santa Cruz Biotechnology, Santa Cruz, CA) for 15 min on ice before addition of the labeled κB probe. The oligonucleotide probe (5′-GGTTACAAGGGACTTTCCGCTG-3′; Eurogentec, Seraing, Belgium) was labeled by in-filling with the Klenow DNA polymerase (Roche, Mannheim, Germany) as described previously (24). Specific activity was always ≥108 cpm/μg. EL4 or EL4-S32,36A cells were grown in six-well plates for 2 days in RPMI 1640 and ultraglutamine with 10% FCS (BioWhittaker) and transfected with 5 μg of κB-Luc reporter plasmid. Plasmids were mixed in OptiMEM (Life Technologies, Little Chalfont, U.K.), added to Fugene liposomes (9 μl; Roche) for 15 min at room temperature and loaded on cells in 2 ml of RPMI containing 10% FCS for 24 h. Then cells were treated with PMA (0.2 μM)-ionomycin (2 μM) or H2O2 (10, 50, 100, or 300 μM). After treatment, cells were cultivated for 24 h and then washed twice in PBS, lysed for 15 min, and centrifuged at 15,000 × g for 4 min. Luciferase activities corrected for the amount of protein (Bio-Rad protein assay) were measured in supernatants. IκBα protein was detected by Western blot analysis using a specific mAb (MAD10B, a gift from R. Hay, St. Andrews, Scotland) or the anti-human full-length IκBα polyclonal Ab (Euromedex, Souffel Weyersheim, France). The MAD10B Ab recognizes a 20-aa stretch within the amino-terminal region of IκBα. Cytoplasmic extracts were prepared at various times after the H2O2-mediated treatment by hypotonic lysis, pelleting the nuclei, and collecting the supernatant fraction (7). Cytoplasmic proteins were added to a loading buffer (10 mM Tris-HCl (pH 6.8), 1% SDS, 25% glycerol, 0.1 mM 2-ME, and 0.03% bromophenol blue), boiled, electrophoresed on a 10 or 12% polyacrylamide-SDS gel, and electrotransferred to Immobilon-P membranes (Millipore, Bedford, MA). Filters were incubated in a primary Ab for 120 min at room temperature (1/500 dilution) and in peroxidase-conjugated rabbit anti-mouse IgG (1/1000 dilution; DAKO, Copenhagen, Denmark) for 60 min at room temperature and finally analyzed using Amersham’s enhanced chemiluminescence system (Amersham, Aylesbury, U.K.) with Fuji x-ray films. Cytoplasmic extracts (500 μg) prepared in hypotonic buffer as described above supplemented with 3 mM EDTA, 1 mM Na3VO4, 1 mM NaF, 0.5 mM β-glycerophosphate, and protease inhibitors (Complete, Roche) were incubated in immunoprecipitation buffer (50 mM Tris, 250 mM NaCl, 3 mM EDTA, 3 mM EGTA, 0.1% Nonidet P-40, 1 mM Na3VO4, 1 mM NaF, 0.5 mM β-glycerophosphate, and Complete) with 5 μl of anti-IKKα Ab (H744, Santa Cruz Biotechnology) or 1 μl of anti-NEMO Ab (from Dr. A. Israel, Pasteur Institute) together with 40 μl of protein A-agarose (Pharmacia, Uppsala, Sweden) overnight at 4°C. Immunoprecipitates were collected by centrifugation and washed three times in the immunoprecipitation buffer and then twice in kinase buffer (50 mM Tris, 100 mM NaCl, 2 mM MgCl2, 1 mM DTT, 0.5 mM PMSF, 1 mM Na3VO4, 1 mM NaF, 0.5 mM β-glycerophosphate, and Complete). Immunoprecipitates were then resuspended in 40 μl of kinase buffer supplemented with [γ-32P]ATP in the presence of 500 ng of the wild-type GST-IκBα1–54 or mutant GST-IκBα1–54 (S32,36A; gift from Dr. R. Gaynor, University of Texas, Dallas, TX) and were incubated at 30°C for 30 min. Reactions were stopped by the addition of SDS loading buffer and were submitted to SDS-PAGE. The gel was then dried and autoradiographed. To check loading and confirm the presence of IKKs, the upper part of the SDS-PAGE was analyzed by Western blotting using the anti-IKKα Ab (H744 Ab, Santa Cruz Biotechnology). NF-κB activation and subsequent IκBα degradation kinetics were first analyzed in control EL4/2 cells following induction by PMA (0.2 μM) and ionomycin (2 μM), IL-1β (100 U/ml), or H2O2 (300 μM). The time course of NF-κB activation by H2O2 was dramatically different from that induced by IL-1β or PMA-ionomycin. As shown in Fig. 1⇓ (left and central panels), addition of PMA-ionomycin to EL4/2 cells gave rise to an important and rapid activation of NF-κB, as detected by EMSA. The complex was already detectable 15 min after induction, and the band intensity gradually decreased up to 240 min following induction. Similar results were observed with IL-1β stimulation, but the kinetics were more transient, with NF-κB almost completely disappearing from the nucleus after 120 min. Analysis of the fate of IκBα in cytoplasmic extracts from these PMA-ionomycin- or IL-1β-stimulated cells revealed that IκBα was rapidly degraded (after 15 min) before being resynthesized rather rapidly (from 30–240 min). Comparison of the kinetics of NF-κB DNA binding activity and IκBα degradation in EL4/2 cells after induction with PMA-ionomycin, IL-1β, and H2O2. pcDNA3-transfected EL4 control cells (EL4/2) were induced by PMA (0.2 μM)-ionomycin (2 μM), IL-1β (100 U/ml), or H2O2 (300 μM). Nuclear and cytoplasmic extracts were prepared at the indicated time points after treatment. For detection of NF-κB DNA binding activity, equal amounts of nuclear extracts (5 μg) were mixed with a 32P-labeled κB probe before being analyzed by EMSA (upper panels). ∗, p50 homodimer; ∗∗, p50/RelA heterodimer. For detection of IκBα, equal amounts of cytoplasmic extracts (15 μg) were analyzed by Western blotting (WB) with the anti-IκBα mAb (lower panels). Samples were loaded onto a 12% SDS-polyacrylamide gel. When EL4/2 cells were treated with 300 μM H2O2, much slower kinetics of NF-κB induction were recorded (Fig. 1⇑, right panel). Indeed, NF-κB was faintly detected in the nucleus of cells 30 min after treatment, but maximal activation was observed after 60 min, with NF-κB induction remaining elevated up to 240 min after addition of H2O2. The slow and sustained NF-κB activation by H2O2 strongly contrasted with the rapid and transient activation induced by either PMA-ionomycin or proinflammatory cytokines such as IL-1β and TNF-α (data not shown). Western blot analysis revealed that IκBα proteolysis occurred concomitantly with the nuclear appearance of NF-κB, reaching its maximum at 60 min, and that newly synthesized forms appeared at later times (Fig. 1⇑). Other IκB molecules were also followed; among them only IκBβ was also degraded upon H2O2 induction (data not shown). These data suggest that the mechanism by which H2O2 caused NF-κB activation and IκBα degradation differs from that used by IL-1β or PMA-ionomycin. IL-1β and PMA-ionomycin are known to cause phosphorylation of IκBα at S32,36, leading to degradation through a proteasome-dependent pathway. We thus verified the implication of these residues in H2O2-mediated IκBα proteolysis. To characterize the molecular mechanisms involved in H2O2-mediated NF-κB activation, we generated EL4 mouse lymphoma cell lines expressing mutated human IκBα inhibitory proteins. EL4 cells expressing the human IκBα gene mutated at S32 and S36 or at position Y42 were called EL4-S32,36A or EL4-Y42F, respectively; those expressing the human IκBα gene mutated at S283, T291, and S299 were called EL4-PEST. In the case of EL4-S32,36A cells, H2O2 stimulation led to NF-κB activation quite similar to that described in control EL4/2 cells, except for the maximum, which was somewhat delayed to 180 min (Fig. 2⇓, left panel). On the other hand, the presence of S32,36A mutated IκBα protein strongly reduced the NF-κB induction mediated by the IL-1β stimulation (Fig. 2⇓, right panel). The very transient activation of NF-κB could very well be due to the translocation of NF-κB bound to the endogenous wild-type murine IκBα molecules. Similar behavior was observed after stimulation with PMA-ionomycin (data not shown). In addition, three independent EL4-S32,36A cell clones expressing different amounts of the human mutated protein gave identical results (data not shown). Analysis of H2O2-mediated NF-κB DNA binding activity in EL4 cells overexpressing human mutated IκBα proteins. EL4 cells overexpressing human IκBα mutated at positions S32 and S36 (EL4-S32,36A); at positions S283, T291, T299 (EL4-PEST); and at position Y42 (EL4-Y42F) were treated with IL-1β (100 U/ml) for the control experiments (right panels), and with H2O2 (300 μM; left panels). Nuclear extracts were taken at the indicated time points after treatment. For detection of NF-κB DNA binding activity, equal amounts of nuclear extracts (5 μg) were mixed with a 32P-labeled κB probe before being analyzed by EMSA. Double-stimulation experiments (central panels) were performed as follows. Cells were pretreated for 3 h with 300 μM H2O2. Half of these cells were used to prepare nuclear extracts, and the other half were treated with IL-1β (100 U/ml) for an additional 30 min. Nuclear extracts were prepared and analyzed as described above. ∗, p50 homodimer; ∗∗, p50/RelA heterodimer. In the case of EL4-Y42F and EL4-PEST cells, EMSAs revealed that the presence of these mutated IκBα molecules almost completely prevented NF-κB activation by H2O2, even at longer time points (up to 5 h; Fig. 2⇑, left panel). The weak NF-κB activation probably came from the translocated NF-κB bound to wild-type endogenous IκBα molecules. EL4 cells bearing the Y42F IκBα mutation were still able to be induced by IL-1β to the same extent as in control cells (Fig. 2⇑, right panel). Comparable results were observed with EL4-PEST cells, but NF-κB activation by IL-1β was prolonged up to 180 min. Because the lack of NF-κB activation by H2O2 in the EL4-Y42F and -PEST cells was reminiscent of a cytotoxic effect, we decided to restimulate them with IL-1β for 30 min following 180 min of treatment with H2O2. As shown in Fig. 2⇑ (central panel), this subsequent stimulation led to NF-κB activation, demonstrating that the lack of NF-κB activation in EL4-Y42F and -PEST cells was not due to a cytotoxic effect or to the loss of an important component of the NF-κB signal transduction machinery. For these experiments, two EL4-Y42F and three EL4-PEST cell clones were tested with identical results. Moreover, the intracytoplasmic p50 and RelA levels were very similar in unstimulated EL4/2 and EL4-Y42F and -PEST cells, demonstrating that the noninducibility of NF-κB in the latter two cell lines was not due to a depletion of RelA and p50 in the intracytoplasmic pool (data not shown). Because NF-κB induction by H2O2 was not inhibited by IκBα mutated at serines 32 and 36, we decided to analyze its composition by supershift experiments. As shown in Fig. 3⇓A, addition of Abs directed against p50 and RelA to nuclear extracts from H2O2- or PMA-ionomycin-stimulated EL4-S32,36A cells induced large, but similar, supershifts. Abs against c-Rel, RelB, and p52 (data not shown) had no effect, demonstrating that induction by H2O2 predominantly induced the classical NF-κB heterodimer in EL4-S32,36A clones. A similar complex (p50/RelA) was detected in the control cell line stimulated with H2O2 (data not shown). A, Supershift analysis of the NF-κB complex activated in EL4–32,36A cells treated with H2O2 or PMA-ionomycin. Nuclear extracts were taken 180 min following treatment with 300 μM H2O2 or 30 min after treatment with 0.2 μM PMA-2 μM ionomycin and then incubated for 15 min at 4°C with Abs against p50, RelA, c-Rel, and RelB. The arrow indicates the position of the supershifted bands. B, Transient transfection assay of EL4-S32,36A and EL4/2 cells treated with H2O2 or PMA-ionomycin. EL4/2 or EL4-S32,36A cells were transfected with 5 μg of κB-Luc before being treated with 0.2 μM PMA-2 μM ionomycin for 24 h or with H2O2 (10, 50, 100, and 300 μM) and then were left in culture for 24 h. Luciferase activity was measured in cell extracts and expressed as the fold increase over that in untreated cells. To demonstrate that the NF-κB induction by H2O2 in EL4-S32,36A cells was transcriptionally active, transient transfection assays were conducted. As shown in Fig. 3⇑B, stimulation of the EL4-S32,36A cells with a κB-LUC construct gave rise to transcriptional activity that increased with the H2O2 concentration (up to 5-fold) and was similar to that obtained in the control cells (Fig. 3⇑B, right panel). On the other hand, while induction of the EL4/2 cells with PMA-ionomycin gave rise to a 12-fold increase in the κB-dependent transcriptional activity, this was sharply reduced in EL4-S32,36A cells (Fig. 3⇑B, left and right panels). These data demonstrated that the NF-κB complex translocated by H2O2 in the nucleus of EL4/2 cells was transcriptionally active and confirmed that the presence of the S32,36A form of IκBα strongly impaired the NF-κB transcriptional activity induced by PMA-ionomycin. Western blot analysis made it possible to distinguish the endogenous murine IκBα from the mutated human molecule. Furthermore, electrophoretic separation of the two molecules was facilitated by the expression of a tagged fusion protein (S32,36A-IκBα). Stimulation of EL4-S32,36A cells with PMA-ionomycin for 30 min revealed that the endogenous murine IκBα molecule was rapidly degraded after addition of PMA-ionomycin, whereas the mutated molecule remained undegraded (Fig. 4⇓A, left panels). It should be emphasized that this mutated molecule progressively accumulated after induction with PMA-ionomycin. Identical results were observed after stimulation with IL-1β or clones expressing various amounts of the mutated IκBα (Fig. 4⇓A, left panels, and data not shown). These observations helped us to understand why a weak and transient NF-κB induction was detected in EL4-S32,36A cells treated with PMA-ionomycin. Indeed, NF-κB nuclear translocation was very likely due to degradation of the wild-type murine IκBα molecule, responsible for the weak transient release of NF-κB (Fig. 2⇑). In contrast, H2O2 induced degradation of both the wild-type and mutated forms (Fig. 4⇓A, right panels). The mutated S32,36A IκBα molecule was degraded after 60 min and reached a maximum after 120 min, at which time 60–70% of the mutated S32,36A IκBα molecules were degraded. This behavior was repeatedly observed in several independent clones (Fig. 4⇓A and data not shown). Because the expression of the mutated gene in EL4-S32,36A cells was variable depending on the clone, we also followed IκBα degradation after H2O2 stimulation in a clone expressing a low amount of the mutated S32,36A IκBα molecule. In that clone, the mutated IκBα molecule first started to accumulate before being degraded with similar kinetics as in the other clones (data not shown). In conclusion, H2O2 treatment systematically led to degradation of S32,36A-mutated IκBα in contrast to what was observed with PMA-ionomycin or IL-1β. 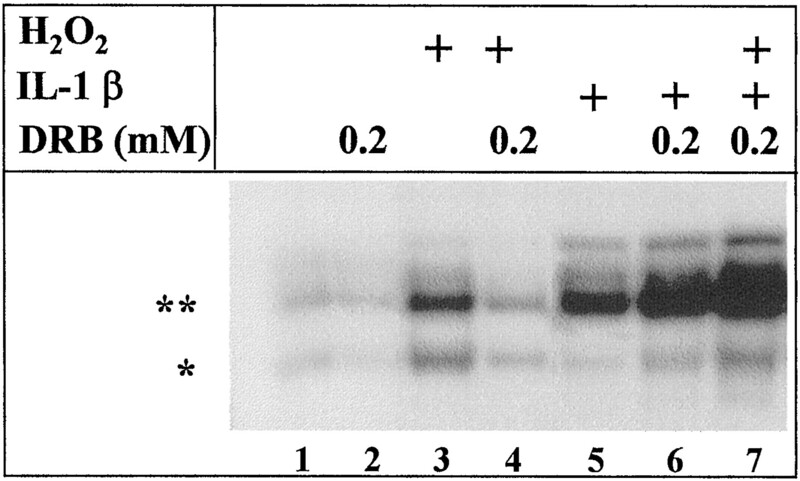 A, Western blot analysis of endogenous and human S32,36A IκBα protein degradation in EL4-S32,36A cells treated with 300 μM H2O2 or PMA (0.2 μM)-ionomycin (2 μM). Cytoplasmic extracts of stimulated EL4-S32,36A cells were prepared at the indicated times after treatment with PMA-ionomycin or H2O2. Equal amounts of cytoplasmic extracts (15 μg) were analyzed by Western blotting with the anti-IκBα mAb. Samples were loaded onto a 12% SDS-polyacrylamide gel using a MiniProtean II cell (Bio-Rad). The positions of the endogenous (WT) and human S32,36A IκBα molecules (Mut) are indicated by arrows. B, H2O2-mediated IκBα phosphorylation. EL4-S32,36A cells were pretreated for 45 min with 50 μM lactacystin and a cocktail of phosphatase inhibitors (1 mM Na3VO4, 10 mM β-glycerophosphate, 5 mM NaF, and 200 nM okadaic acid) before being treated with either PMA (0.2 μM)-ionomycin (2 μM) or H2O2 (300 μM). Cytoplasmic extracts were performed at the indicated times after treatment, and equal amounts of proteins (15 μg) were analyzed by Western blotting with the anti-IκBα 10B mAb. Migration of the samples was performed for 10 h on a 10% SDS-polyacrylamide gel using a longer gel to ensure optimal separation of the phosphorylated forms of IκBα (Protean II xi cell, Bio-Rad). The positions of the endogenous (WT) and phosphorylated IκBα molecules (PIκBα) are indicated by arrows. Cytokine-inducible phosphorylation of IκBα at S32,36 was necessary for its degradation and subsequent NF-κB activation. Because IκBα degradation was observed following treatment with H2O2 even when serines 32 and 36 were substituted for alanines, we were interested to know whether this treatment promoted IκBα phosphorylation at other sites. We examined IκBα phosphorylation after treatment with H2O2 in the presence of lactacystin, a proteasome inhibitor (28), and several phosphatase inhibitors to abolish phosphorylated IκBα degradation. Cell extracts were prepared at time points preceding the appearance of nuclear NF-κB. These experimental conditions allowed us to visualize phosphorylated murine IκBα protein after 5 min of stimulation with PMA-ionomycin and 10–20 min after addition of H2O2 (Fig. 4⇑B). However, when the mutated IκBα form was analyzed, no upshifted band was visualized after treatment with H2O2. To confirm our data showing that mutated S32,36A IκBα molecules can always be degraded after oxidative stress, we investigated the effect of H2O2 treatment on the induction of IKK activity. These kinases have been shown to specifically phosphorylate IκBα at S32 and S36. To examine this activity, IKKs were immunoprecipitated using either an anti-IKKα Ab or an anti-NEMO Ab. Control experiments with IL-1β or PMA-ionomycin stimulations dramatically increased IKK activity 5 min after stimulation, as shown by phosphorylation of the wild-type GST-IκBα fusion protein (Fig. 5⇓, upper panel). This reaction was specific, because no phosphorylation of the mutated GST-IκBα S32,36A was detected under these conditions (Fig. 5⇓, lower panel). In contrast, no IKK activity was detectable at any times after H2O2 stimulation (Fig. 5⇓, upper panel). Again, no phosphorylation of IκBα was observed when the substrate was replaced by its mutated counterpart (Fig. 5⇓, lower panel). 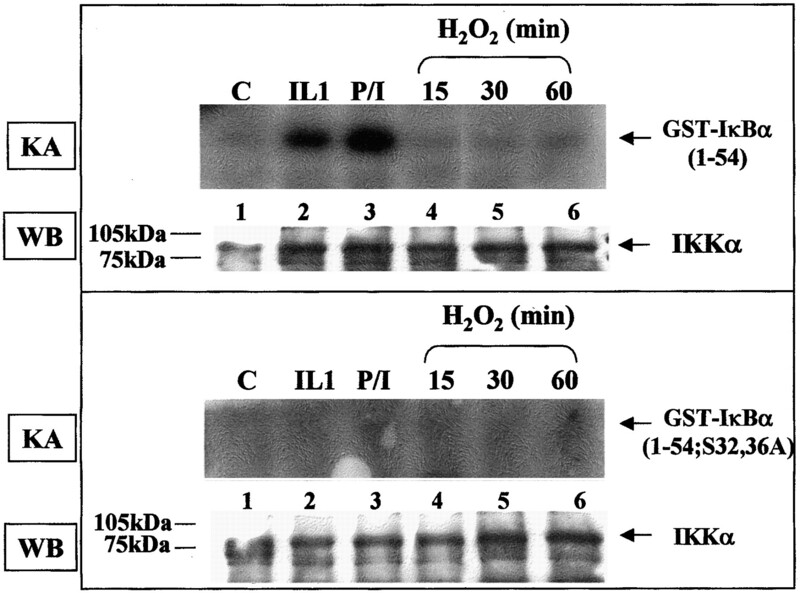 These results indicate that IKKs were not involved in IκBα phosphorylation after treatment with H2O2. IKKs are not activated by treatment with H2O2. EL4/2 cells were either untreated (lane C) or exposed to IL-1β (100 U/ml) for 5 min, PMA (0.2 μM)-ionomycin (2 μM) for 5 min, or H2O2 (300 μM) for the indicated times. After treatment, cytoplasmic cell extracts were prepared. Immunoprecipitates from treated cells were subjected to in vitro IKK assay (KA) using either wild-type GST-IκBα1–54 (upper panels) or mutant GST-IκBα1–54 (S32A, S36A; lower panels). The presence of IKKα was confirmed in each experiment by Western blotting (WB). IκBα proteolysis was then analyzed in EL4 -PEST cells. As shown in Fig. 6⇓, analysis of both endogenous wild-type and mutated IκBα forms revealed that after induction with IL-1β, both IκBα molecules were degraded and resynthesized with kinetics similar to those observed with EL4/2 control cells subjected to identical conditions. Inversely, degradation of the mutated IκBα was totally inhibited after treatment with H2O2, explaining why NF-κB activation was undetectable in these clones (Fig. 2⇑). It should be noted that the level of mutated gene expression was rather high in the EL4-PEST cells and very similar in all the clones tested. These data indicated that serine and threonine residues (S283, T291, and T299) situated around the PEST sequence were required for IκBα degradation and subsequent NF-κB activation following treatment with H2O2. Western blot analysis of endogenous and human PEST or Y42F IκBα protein degradation in EL4-PEST or EL4-Y42F cells treated with 300 μM H2O2 or 100 U/ml IL-1β. Cytoplasmic extracts were taken at the indicated times after treatment, and equal amounts of proteins (15 μg) were analyzed by Western blotting with the anti-IκBα 10B mAb. Samples were analyzed as described in Fig. 4⇑A. The positions of the endogenous (WT) and human mutated IκBα molecules (Mut) are indicated by arrows. Western blot analysis of EL4-Y42F cells stimulated with IL-1β gave rise to a rapid proteolysis of both IκBα forms, whereas no degradation of the mutated molecule was observed after H2O2 induction (Fig. 6⇑). The separation of human and murine IκBα forms was rendered difficult by the quite similar electrophoretic mobility of the two proteins as well as by overexpression of the mutated molecule. In conclusion, these data indicated that the Y42 residue of IκBα protein was also required for IκBα degradation and subsequent NF-κB activation following treatment with H2O2. The various clones tested exhibited similar behaviors. Since we demonstrated that the IκBα degradation pathway following H2O2 very likely involved different residues from those important in the response to cytokines, we investigated the role of the 26S proteasome in H2O2-mediated IκBα proteolysis. To ascertain proteasome involvement in IκBα proteolysis, NF-κB activation was followed in the presence or the absence of lactacystin. EMSA analysis showed that pretreatment of cells with lactacystin inhibited NF-κB translocation after treatment with PMA-ionomycin, whereas it had only a weak effect on NF-κB translocation induced by H2O2 (Fig. 7⇓, left and central panels). Taken together, these observations indicate that treatment of EL4/-S32,36A cells with H2O2 led to inducible IκBα phosphorylation and that degradation upon stimulation could be conducted by a proteasome-independent mechanism. 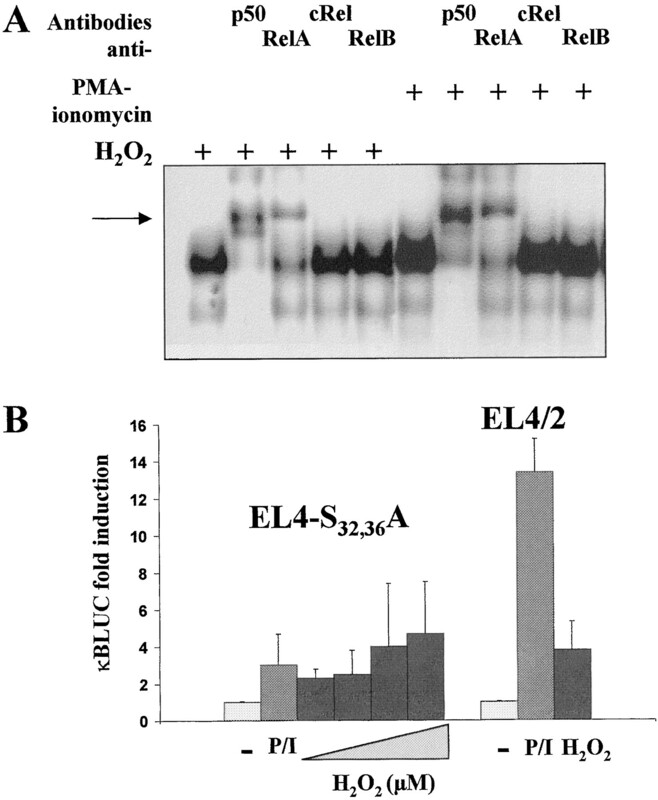 Effects of lactacystin and E64-d on H2O2-mediated NF-κB DNA binding activity in EL4-S32,36A cells. Cells were pretreated or not for 45 min with 50 μM lactacystin or E64-d (25 μg/ml) before being stimulated with PMA (0.2 μM)-ionomycin (2 μM) or H2O2 (300 μM). Nuclear extracts were taken at the indicated time points after treatment and analyzed as described above. For detection of NF-κB DNA binding activity, equal amounts of nuclear extracts (5 μg) were mixed with a 32P-labeled κB probe before being analyzed by EMSA. ∗, p50 homodimer; ∗∗, p50/RelA heterodimer. Because caspases were recently shown to be capable of cleaving IκBα (29), EL4/2 cells were treated with PMA-ionomycin or H2O2 in the presence of 100 μM Z-DEVD, which inhibits caspase-3, -6, -7, -8, and -10. Nevertheless, under our experimental conditions, addition of Z-DEVD did not modify NF-κB activation after treatment with either PMA-ionomycin or H2O2, indicating that caspases were not involved in IκBα degradation (data not shown). Another protease, calpain, was recently suggested to be involved in NF-κB regulation (30, 31). E64-d has been shown to be a calpain protease inhibitor (32), although its absolute specificity in inhibiting calpain has been debated. However, E64-d has several important characteristics, such as being easily taken up by cells and inhibiting calpain proteases without inhibiting the proteasome. 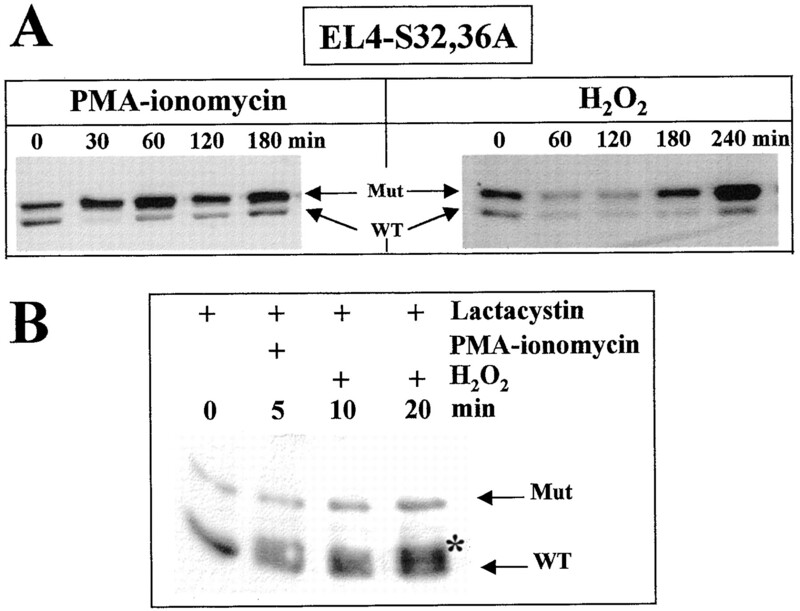 EL4/-S32,36A cells were therefore incubated in the presence of E64-d before being treated with PMA-ionomycin or H2O2. As shown in Fig. 7⇑ (right panel), E64-d partially inhibited NF-κB activation in EL4/-S32,36A cells treated with 300 μM H2O2, demonstrating that calpain was involved in the degradation process. To ensure that H2O2 addition by itself is not involved in the degradation mechanism, IκBα was transcribed and translated in vitro before being subjected to H2O2 for 30 and 60 min. Under these conditions, IκBα was not altered by the treatment, confirming that oxidative treatment by itself did not lead to IκBα degradation (data not shown). Caseine kinase II has been shown to be involved in constitutive phosphorylation of several serine and threonine residues of the PEST region of IκBα (33). 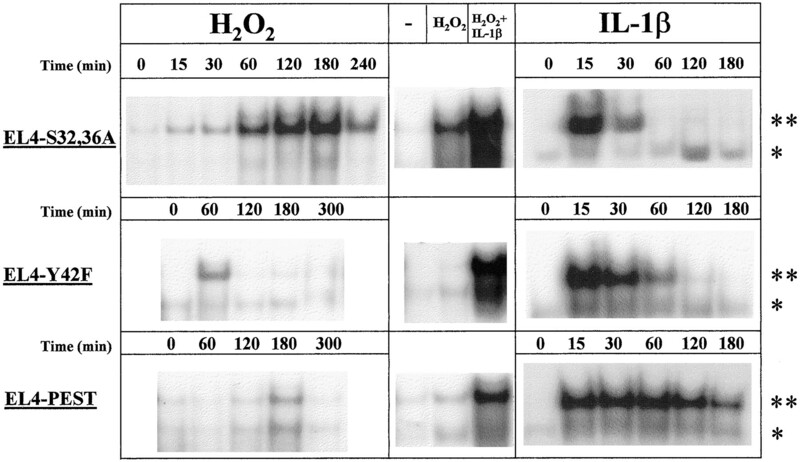 To investigate whether casein kinase II could be part of the induced IκBα degradation and NF-κB activation by H2O2, EL4/2 cells were treated with 300 μM H2O2 for 2 h in the presence of DRB (0.2 mM), which specifically inhibits casein kinase II (34) without inducing any cytotoxic effect. As shown in Fig. 8⇓, EMSA analysis revealed that NF-κB activation was inhibited with 0.2 mM DRB, while no effect on NF-κB induction mediated by IL-1β was observed with this DRB concentration. DRB had no effect on NF-κB activation when EL4/2 cells were treated with PMA-ionomycin (data not shown). This indicates that casein kinase II could well be involved in NF-κB activation in EL4/2 cells after H2O2 treatment. It must be noted that the higher DRB concentrations (0.5 or 1 mM) were cytotoxic for the cells (data not shown). Effect of casein kinase II inhibitor DRB on NF-κB DNA binding activity induced by H2O2 or IL-1β. EMSA analysis of NF-κB activation in EL4/2 cells by 300 μM H2O2 or 100 U/ml IL-1β after preincubation in the presence of increasing amounts of casein kinase II inhibitor (DRB; 0.2 mM). Cells were preincubated with DRB for 1 h before being stimulated for 2 h with H2O2 (lanes 4–6) or for 165 min before a 15-min IL-1β stimulation (lanes 7–9). This schedule was chosen to ensure that DRB was in contact with the cells for the same duration in all experimental conditions. H2O2- and DRB-treated cells (lanes 5 and 6) were also restimulated for 15 min with IL-1β to control the cytotoxic effect of DRB (lanes 10 and 11). Nuclear extracts were prepared, and equal amounts of protein were mixed with a 32P-labeled κB probe. Samples were analyzed as described in Fig. 1⇑. ∗, p50 homodimer; ∗∗, p50/RelA heterodimer. In this study we present several lines of evidence for a novel NF-κB activation process triggered by H2O2 that is clearly different from the well-characterized IκBα S32,36 phosphorylation-K21,22 ubiquitination-proteasome pathway. Indeed, NF-κB activation by H2O2 in a lymphoma cell line (EL4) is associated with a slow and sustained activation of NF-κB through an atypical mechanism of IκBα degradation. It does not require serine 32 and 36 phosphorylation by IKK, but probably relies on an unmodified tyrosine residue 42 and the carboxyl-terminal PEST sequence to be phosphorylated by casein kinase II. The degradation involves the calpain proteases and the proteasome. The NF-κB complex activated by H2O2 in EL4 cells is the heterodimer p50/RelA and is transcriptionally active (data not shown). The Rel/NF-κB activation induced by several extracellular signals, such as proinflammatory cytokines (IL-1β and TNF-α), requires proteolysis of the associated IκBα by the phosphorylation-dependent ubiquitin-proteasome pathway (reviewed in Refs. 35 and 36). Only four exceptions to this general signaling pathway have been reported to date: 1) NF-κB activation following exposure to pervanadate or hypoxia-reoxygenation, which induces IκBα phosphorylation at tyrosine 42 and dissociation from NF-κB without degradation (37); 2) a continuous nuclear transport of p50-c-Rel dimer induced by high level basal degradation of associated IκBα requiring free calcium (30); 3) NF-κB activation by amino acid analogues through a redox-controlled IκBα degradation by the proteasome without apparent IκBα phosphorylation (38); and 4) IκBα phosphorylation by p90rsk in response to mitogens (39) or for mucin overexpression in epithelial cells by Pseudomonas aeruginosa (40). These latter data suggest that different transduction pathways leading to NF-κB activation may coexist within a cell, with one pathway either being preferentially triggered by a defined stimulus or one stimulus triggering a different pathway in another cell type. It has recently been shown that short wavelength UV (UV-C) activates NF-κB independently of phosphorylation at serine residues 32 and 36 (41, 42). Furthermore, expression of a catalytically inactive IKK-β mutant did not prevent NF-κB activation by UV-C (42), indicating that distinct activation mechanisms can function in parallel within one cell type. In the case of oxidative stress mediated by H2O2, a common observation is the slow and sustained activation of NF-κB correlating with IκBα degradation (this work and Refs. 24 and 43 ; see Ref. 44 for review). This same phenomenon was observed when cells were induced by other agents known to generate oxidative stress, such as UV light (45), hypochlorous acid (24), or photosensitization (25, 26). Because these kinetics of activation strongly contrast with those initiated by proinflammatory cytokines, we postulated that the respective transduction mechanisms are different. A first striking observation made in this work is the nonrequirement of intact serine 32 and 36 residues for NF-κB activation and IκBα degradation. However, the integrity of either tyrosine 42 or the PEST sequence is needed for IκBα degradation and NF-κB activation by H2O2. Numerous authors have reported that the PEST sequence is essential for IκBα degradation and stabilization and also for the rapid proteolysis of the unassociated IκBα (32, 46, 47, 48, 49, 50). Three residues (S283, T291, and T299) are important for phosphorylation by casein kinase II and constitutive phosphorylation of IκBα in vivo (33). The PEST sequence has been shown not to be required for IκBα signal-induced degradation, but its removal stabilizes free IκBα in unstimulated cells (51). This stabilization of IκBα mutated in the PEST sequence correlates well with our observation of a very low nuclear NF-κB content in uninduced EL4-PEST cells. However, we found that mutation of these three residues within the PEST sequence abolishes IκBα-inducible degradation by H2O2. The role of the PEST sequence in response to H2O2 contrasts with its noninvolvement in the responses to IL-1β and TNF-α in EL4 (see above) or to TNF-α in 293 cells (50). Reinforcing our data, it has recently been shown that a stretch between amino acid positions 277 and 287 of the carboxyl-terminal part of IκBα is important for the early onset of NF-κB after UV irradiation of primary human skin fibroblasts and HeLa cells (41). Thus, our data together with reports from the literature demonstrate that the carboxyl-terminal part of IκBα is important for inducible phosphorylation. Casein kinase II could very well be involved in this reaction. It should be pointed out, however, that multiple kinase activities are likely to be involved, because tyrosine, serine, and threonine residues have been shown to be important. Because IKK-α and -β have been shown to selectively phosphorylate S32,36 residues (22, 23), it is very likely that these two kinases are not responsible for the H2O2-induced phosphorylation of the S283 and T291,299 residues of the PEST sequence. Casein kinase II, on the other hand, has been found to physically associate with the PEST sequence of IκBα, inducing a multisite (serine/threonine) phosphorylation required for basal and HIV-induced degradation of IκBα in vitro (46). It has recently been shown that purified endogenous casein kinase II effectively phosphorylated serine 32 of IκBα and that when associated with p90rsk, this kinase complex is capable of phosphorylating both degradation-relevant serines in IκBα and also exists as a preassembled kinase-substrate complex containing all known IκB isoforms and most Rel family members (51). These last data together with many other reports, such as in U937, Chinese ovary, and rat lymphoid cells treated with bufalin (52), insulin (53), and prolactin (54), demonstrate the inducibility of casein kinase II. It is thus clear that casein kinase II activity may be stimulated by various stimuli, and oxidative stress is probably one of them. Indeed, A170, which is an oxidative stress-inducible protein with a zinc finger, two PEST sequences, and many potential phosphorylation sites for serine/threonine kinases, is phosphorylated in activated macrophages by two 40- and 44-kDa kinases similar to α and α′ subunits of casein kinase II (55). How phosphorylation of the PEST sequence by casein kinase II in response to H2O2 targets IκBα for degradation is still unknown. We have also shown that inhibition of calpain proteases partially prevents NF-κB activation in EL4 cells in response to H2O2. From these experiments we deduced that phosphorylated IκBα protein on S/T residues in the PEST sequence becomes a substrate for digestion by calpains. This conclusion is reinforced by recent data showing that the PEST sequence of IκBα is critical for its calpain-dependent degradation (56). Furthermore, the IκBα-PEST domain binds to the calmodulin-like domain of the large subunit of μ-calpain and acts as a modulator in promoting the physical association and subsequent degradation by μ-calpain. Although IκBα degradation is attributed primarily to the ubiquitin-proteasome pathway, there have recently been a number of alternate proteolytic mechanisms described for IκBα, including some that specifically implicate isoforms of calpain as the direct IκBα protease (30, 31, 56, 57, 58). Among the known substrates of calpains are peptides with large aliphatic or aromatic side chains, but there exist at least two other motifs: the presence of PEST sequences or of calmodulin-binding domains (see Ref. 59 for review). PEST sequences have frequently been considered a necessary feature of proteins cleaved by calpain. The rationale for this proposal is the acidic chain character of the PEST sequence, which could sequester Ca2+ until its concentration would become high enough to satisfy the calpain requirement. Calpains are cysteine proteases activated by Ca2+ binding to a catalytic subunit of about 80 kDa (59). While most of the mechanism of calpain activation is still a matter of debate, it is known that a rise in the Ca2+ concentration, heterodimerization, and membrane association (60) are important means for in vivo activation. Regulation of the free intracellular calcium concentration plays a major role in physiological signal transduction and has been shown to be important for NF-κB activation (61). It has recently been shown that TNF-α-inducible IκBα proteolysis in HepG2 liver cells is mediated by calpain (31). This inducible calpain proteolytic activity occurs coincidentally with the particulate-to-cytosol redistribution of the catalytic μ-calpain subunit into the IκBα compartment (31). Exposure to agents that produce hydroperoxides or the addition of exogenous hydroperoxides also causes elevation of intracellular Ca2+ in some cells (60). Because Ca2+ release after exposure to H2O2 is well documented together with calpain activation under oxidative stress conditions (62, 63), it is clear why IκBα phosphorylation in the PEST sequence becomes a substrate for degradation by calpains. In conclusion, this work supports the important function of tyrosine 42 and the carboxyl-terminal PEST sequence in the phosphorylation and degradation of IκBα upon exposure to H2O2. This sequence of events raises the question of how casein kinase II is activated by oxidative stress and why S/T residues within the PEST sequence, which have been shown to be important for constitutive phosphorylation, also play a role in inducible IκBα degradation. We thank Dr. R. Greimers for help with cell cloning. ↵1 This work was supported by grants from the Belgian National Fund for Scientific Research (Brussels, Belgium), the Sidaction Research Program (Paris, France), the Concerted Action Program (Communauté Française de Belgique), and the Biomed-II Program of the European Communities (BMH4-CT97-2387 to J.P.) and by a grant from the Association pour la Recherche sur le Cancer (to M.K.). J.P. is a Research Director with the Belgian National Fund for Scientific Research. S.S. is supported by a concerted action program from the Communauté Française de Belgique. 3 Abbreviations used in this paper: ROS, reactive oxygen species; IKK, IκB kinase; E64-d, l-3-trans-ethoxycarbonyloxirane-2-carbonyl]-l-leucine (3-methyl) amide; DRB, 5,6-dichloro-1-β-d-ribofuranosyl-benzimidazole; NEMO, NF-κB essential modulator; PEST, proline-glutamic acid-serine-threonine; Z-DEVD, Z-Asp-Glu-Val-Asp-FMK.